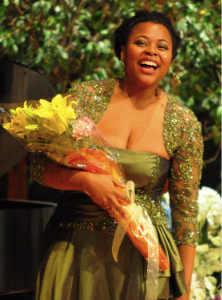 Madagascar-born Canadian soprano Yannick-Muriel Noah is recognized in Europe and North America for her sumptuous lyricism and the dramatic intensity of her portrayals. Critics have hailed her as “one of the most beautiful spinto soprano voices that one can imagine” (General Anzeiger), with “vocal brilliance, physical stamina and expressive versatility” (Theater Pur), “dramatic flair” (New York Times), “deep feeling and great stage presence” (General Anzeiger), a “magnificent [...] melodious soprano” (Opernglas), who offers “a performance of distinction” (The Guradian), and “without a doubt: Here too, is Noah in a league of her own” (Opernnetz). She has collaborated with such prominent conductors as Nicola Luisotti, Will Humburg, and David Parry. In 2018, Ms. Noah was nominated as Singer of the Year in Opernwelt for her interpretation of Countess Rosine in Oberst Chabert, conducted by Jacques Lacombe. She premiered the role of Jenny Marx in Jonathan Dove’s new opera Marx in London. She also made her début at the Deutsche Oper am Rhein as Aida, and sang the same role at the Staatsoper Hannover. With the Canadian Opera Company, Ms. Noah performed Madama Butterfly, a role she later repeated for Staatsoper Hannover, and covered for San Francisco Opera. Also at the COC, she performed Tosca and premiered Mona in James Rolfe’s Swoon. Other selected Canadian credits include Nedda in Pagliacci for Opera Lyra Ottawa, Tosca for Edmonton Opera, Verdi’s Requiem with the Victoria Symphony and the Elora Festival, Beethoven’s Ninth Symphony for l’Orchestre symphonique de Québec, and Messiah for the National Arts Centre and the Edmonton Symphony Orchestra. In Spain, she performed Margherita in Mefistofele in Valencia opposite Ramón Vargas and Ildar Abdrazakov, and toured Catalonia as Aida. In the UK, she premiered Emily Hall's Sante with Aldeburgh Productions and Almeida Theatre. In Austria, she sang Aida and La Wally for Stadttheater Klagenfurt, and Aida at the Opernfestspiel Sankt Margarethen. Further European engagements include Aida for Lyric Opera Dublin, the Schlossfestspiele Schwerin, and the Aalto-Musiktheater Essen, Ariadne auf Naxos and Aida with Theater Heidelberg. In South Korea, she performed Fidelio at the Daegu Opera House, in the United States, she sang Aida with the Michigan Opera Theatre, and in Australia, she opened the Melbourne Festival in Michel van der Aa’s After Life. Ms. Noah’s numerous awards include several top prizes at the following international singing competitions: Jaume Aragall, Concours Musical International de Montréal, Palm Beach, Lotte Lenya, George London Foundation, William Matheus Sullivan Foundation, Brian Law, Marmande, and the prestigious Hans Gabor Belvedere. Ms. Noah also holds a Bachelor of Architectural Studies from Carleton University.